This year our Theme was horror movies. 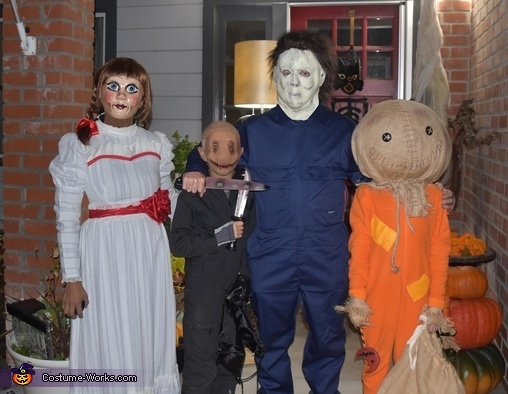 The characters are Annabelle (mom) Smiley (Andrew, 10 years old) Sam from trick r treat (David, 12 years old) and Mike Myers from Halloween. Annabelle, Smiley and Sam are handmade costumes. Annabelle mask was sculpted with paper clay and painted with acrylic paint. The hair was made out of a long faux red Hair wig, I styled with front bangs and braided. The dress was also Handmade. Sam was made with paper mache (piñata) and covered with Burlap fabric. Stitches were made with natural string and added buttons as eyes. The pijamas were handmade and his bag was made also with burlap fabric. Overall cost per costumes $50 we had to buy most of the materials and watch many videos to learn how to work with latex.